When you look in the mirror, you should feel happy and confident with the smile you see. If you’re bothered by crooked, cracked, chipped or stained teeth – or with how your gums look – cosmetic dentistry could be the solution you’ve always wanted. Cosmetic dentistry procedures range from very minor to more advanced transformations – it’s all up to you, and what you feel is right for your smile. At Markham Eglinton Dental Centre, a skilled Scarborough cosmetic dentist can lighten and remove stains from your teeth, or suggest veneers to correct your tooth’s colour, close a space, or repair a cracked tooth. Bonding can change the shape and colour of your teeth. The following interactive tools will help you determine whether cosmetic dentistry is right for you. ▸ Am I A Candidate? Here are a few common cosmetic dentistry procedures: including using veneers to correct a tooth’s colour, close a space, or repair a cracked tooth. These are ultra-thin laminates that we bond directly to your teeth. They are used to correct a tooth's colour, close a space, or repair a cracked tooth. A crown completely covers (caps) a tooth, protecting it and keeping it strong. They can be made of gold, porcelain fused to metal, or pure white porcelain (to resemble your natural tooth). 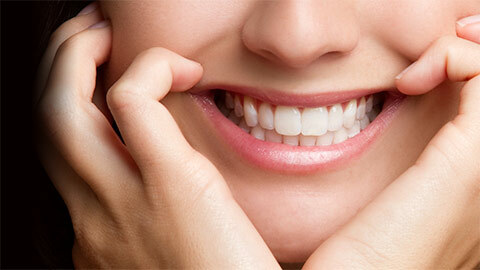 Teeth whitening is very popular because of its amazing ability to revitalize a smile. It allows us to remove or reduce stains, lightening your teeth for a more attractive appearance. Bonding is used to improve the appearance of teeth, or to close gaps between them. A resin material is applied to the teeth and hardened using a special light. We can change the colour and shape of your teeth with bonding. Transform your smile with cosmetic dentistry – take the first step by contacting Markham Eglinton Dental Centre, a cosmetic dentist in Scarborough. Q: Are crowns and veneers the same thing? A: No. A veneer is a thin laminate that is bonded directly to your teeth, and is used to correct a tooth's colour, close a space, or repair a cracked tooth. A crown is an artificial tooth that completely encircles (caps) your natural tooth. Q: Are my teeth stained yellow because I drink coffee and red wine? A: Red wine, coffee and tea are notorious for staining your teeth. Diet soda is also a problem, because its acidity breaks down your tooth's enamel -- leaving it prone to stains. You don't need to cut out these beverages entirely in order to protect your teeth -- just be mindful of what they might do to your smile, and try to limit your intake. Q: I want my teeth to look like a celebrity’s – pretty and bright and perfectly-shaped. How could cosmetic dentistry help me achieve that? A: Veneers could be the solution for you. They can improve the aesthetics of a person's smile very quickly, because the ultra-thin laminates are bonded to your natural teeth – correcting the shape and colour. Talk to us today to learn more.